This book is a comprehensive guide to the 1Z0-803 exam. You'll explore a wide range of important Java topics as you systematically learn how to pass the certification exam. Each chapter starts with a list of the exam objectives covered in that chapter. You'll find sample questions and exercises designed to reinforce key concepts and to prepare you for what you'll see in the real exam, along with numerous tips, notes, and visual aids throughout the book. To earn the OCA Java SE 7 Programmer Certification, you need to know your Java inside and out, and to pass the exam it's good to understand the test itself. This book cracks open the questions, exercises, and expectations you'll face on the OCA exam so you'll be ready and confident on test day. 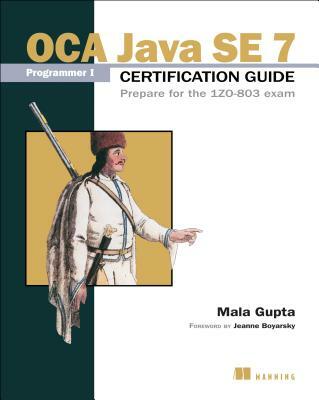 OCA Java SE 7 Programmer I Certification Guide is a comprehensive guide to the 1Z0-803 exam. You'll explore important Java topics as you systematically learn what is required. Each chapter starts with a list of exam objectives, followed by sample questions and exercises designed to reinforce key concepts. It provides multiple ways to digest important techniques and concepts, including analogies, diagrams, flowcharts, and lots of well-commented code. Written for developers with a working knowledge of Java who want to earn the OCA Java SE 7 Programmer I Certification. Mala Gupta has been training programmers to pass Java certification exams since 2006. She holds OCA Java SE7 Programmer I, SCWCD, and SCJP certifications.